Assault style-weapons and magazines that hold more than 10 rounds would be banned in Washington, under a proposal released Monday by Attorney General Bob Ferguson. A second proposal would leave them legal but raise the age limit and require licensing. 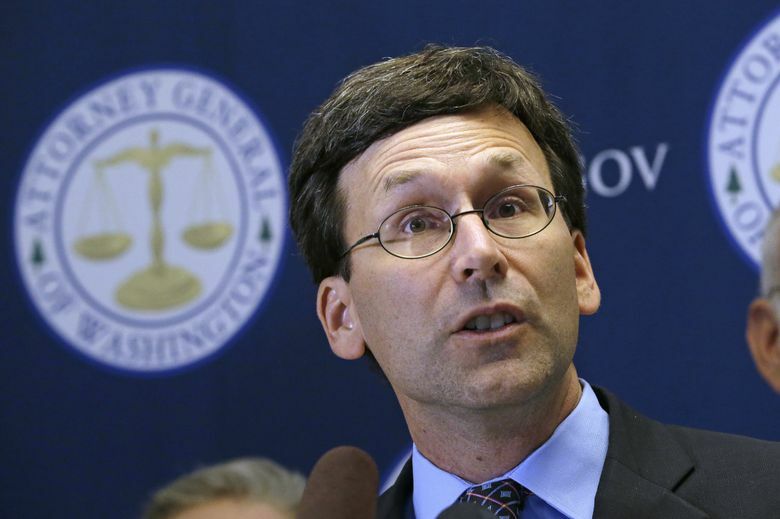 Attorney General Bob Ferguson proposed legislation on Monday that would ban the sale of assault-style weapons and high-capacity magazines in Washington. Recognizing the political difficulty of such a bill, Ferguson also released an alternative on Monday: a bill that would keep assault-style weapons legal but would make them more difficult to buy, by raising the minimum age to legally own such a firearm and requiring them to be licensed, similar to a concealed-weapons license. Ferguson announced in September that he would seek an assault-weapons ban. The draft bill released Monday, the first day of the 2017 Legislature, would ban semi-automatic rifles that have a detachable magazine and a pistol grip beneath the barrel. It would also ban magazines that hold more than 10 rounds of ammunition and semi-automatic pistols with a fixed magazine that can accept more than 10 rounds of ammunition. Ferguson, a Democrat who easily won re-election in November, said the definitions of “assault weapon” used in his bill are similar to those used in laws in New York and Connecticut that withstood legal challenges. The ban would apply only to sales of such weapons, grandfathering in currently owned guns. A second bill from Ferguson would not ban such weapons but would require them to be licensed. To get a license, a person would have to be at least 21 (rather than 18), would have to complete a gun-safety class and could not have been convicted of a felony. To buy an assault weapon, a person would need a license, an additional in-depth background check and be subject to a 10-day waiting period. Similar restrictions are already in place on hand guns, which are currently more difficult to buy than assault-style weapons. Both bills will be sponsored by Sen. David Frockt, D-Seattle, among others. Frockt was one of dozens of solely Democratic lawmakers and officials at a September news conference, in which Ferguson said he’d been spurred by the July killings of three teenagers in Mukilteo. Allen Ivanov, the shooter in the Mukilteo killings, pleaded guilty in December. Ivanov, then 19, had, according to police, legally purchased an AR-15 — a common assault-style weapon that would be banned by Ferguson’s bill — just days before the killings. Similar weapons were used in high-profile mass shootings in Newtown, Conn.; Aurora, Colo.; San Bernardino, Calif., Dallas and Orlando, among others. Among the supporters standing with Ferguson in September were the parents of Will Kramer, who was wounded in the Mukilteo shooting. Kramer’s parents spoke in support of an assault-weapons ban then, and his father did so again Monday. “If our current political leadership doesn’t have the will to pass a ban on the sale of assault weapons, I would support the assault weapons enhanced background check bill as an incremental step towards increasing public safety and reducing gun violence,” Paul Kramer said in a statement. Gun-safety measures have had far more success in recent years as ballot initiatives than in the Legislature, where Republicans control the state Senate and generally oppose new restrictions on guns. A push for universal background checks passed on the ballot in 2014 after failing in the Legislature in 2013. A process to keep guns away from people deemed dangerous — following a court order — passed on the ballot in November after previous legislative failures.